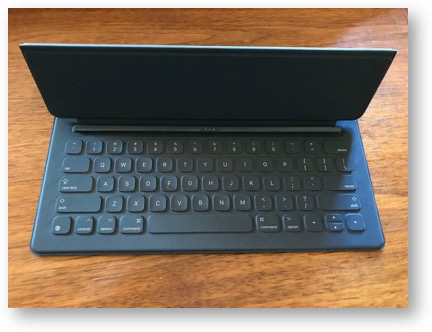 Do you remember the story about the iPad Pro keyboards failing? I’ll refresh your memory before I tell you the latest in that saga. A while back, my 12.9″ iPad Pro started having a pop up message on screen saying that this device was not supported. It turned out to be the Smart Keyboard from Apple. Shortly after I contacted Apple about it, Apple extended the warranty on the Smart Keyboard to three years because of functional issues. I got the keyboard replaced in store, but then the new keyboard with my original iPad Pro started having weird graphics glitches. At my second Genius Bar appointment they pointed out that it was unclear whether it was the iPad or the keyboard that was failing, so they replaced the keyboard and the iPad itself. That sounded awesome at the time, but I kinda wish I hadn’t said yes to that. Immediately on bringing my new devices home, the 2nd iPad with the 2nd keyboard started rebooting spontaneously while I was using it and even if I wasn’t. I disconnected the iPad from the keyboard and it still rebooted spontaneously. Off to my 3rd Genius Bar appointment. This time, they let me keep the keyboard, but gave me a 3rd iPad Pro. That’s where we last left our fearless heroine.A couple weeks after I got the 3rd iPad Pro, we went on our trip to Grand Teton and Yellowstone. The first day of the trip, I pulled out the iPad and the touch screen was non-responsive. Irritated, I rebooted it holding down the power and sleep/wake button. Still no joy. I did it two or three more times without success. Later that night I handed it to my friend Diane, she held down both buttons, it rebooted and that fixed it. Don’t you hate it when that happens? Except that in the last week since we got back, two more times the screen became non-responsive to touch. Oddly when it’s in this state, there appeared to be nothing else wrong with the iPad. I could interact with it using the Smart Keyboard. For example, I could enter my password, and use spotlight with command-space to launch apps. Obviously, the internals of the iPad were fine but the touchscreen was borked (to use a technical term). The third time this happened, a hard reboot with both buttons didn’t bring the touch screen to life. I found the Apple Support Article on what to do if your screen doesn’t respond to touch. They said to clean it. They said to remove your screen protector if you have one. My favorite advice though was they said to restart the device by holding the sleep/wake button until the slider appears and then drag the slider to turn your device off. Yup, on an article about how to deal with a touchscreen that doesn’t work, they said to use the touch screen. They did go on to explain that you could use the two buttons to restart if that didn’t work. Their final recommendation was to take your device into an Apple Authorized Service Provider. So I made yet another Genius Bar appointment (if you’re playing along with our home game, that’s visit number 4). A couple of hours before my appointment, I decided to call Apple and see if I could get through to Customer Relations. These are the people who have special powers to help guide your case when it gets to the point of absurdity. It was Customer Relations who 4 years ago finally got me a new 27″ Apple Cinema Display when mine kept blinking on and off because of incompatibility with the then new MacBook Pros. After 20 minutes I successfully got through to Melissa, but I will not call her “my little friend”. I was super nice to her (at the beginning) and very complimentary of the care I had gotten from all of the people at Apple. I told her that everyone that had been involved with this had done everything right, but that I needed new solution. I told her that I thought it was time that we stopped giving me refurbished iPads and swapped in a new device instead. And that’s when things started to go downhill. Melissa adamantly said that Apple does not give customers refurbished devices as replacements. I called her on that and brought up the recent successful lawsuit in Europe where it was deemed illegal to give customers refurbished iPhones as replacements for defective units. She said the law is different in Europe (which has nothing to do with whether the devices are refurbished). We went back and forth a bit until she said something interesting. She referred to replacements as remanufactured. I asked her to explain to me how remanufactured is different from refurbished. She said that with remanufactured devices, some of the internal components may have been recycled but the outside is brand new (she said that last bit with a cheery voice as though that would matter to me). I told her that I didn’t care about the specific terminology and that I had bought refurbished items through Apple’s Refurb store (and yes, they call it that). I tried to tell her that my goal was to get a new device. But during this part of the conversation, she repeatedly started talking over me. I’d be halfway through my point and she’d just start talking and would not stop. She started trying to tell me that when I get another iPad from my Genius appointment, I really shouldn’t restore from a backup. I tried to explain that video glitches and spontaneous reboots and a non-responsive touch screen are not software problems. But she couldn’t hear me because she kept interrupting me and talking over me. At this point, I got angry. I yelled at her. Not because of what she was telling me but because she would not listen. At that point she stopped talking. I couldn’t get her to respond to me unless I explicitly asked her to talk. It was childish on her part, but perhaps I could have held my temper and handled it better myself. She finally asked me what she could do, and I told her that she could do nothing for me, but she could do something for future customers. She could give them a chance to explain things to her. I hung up. So off to the Apple Store yet again. I had tried being nice in the Apple Store, I’d tried accommodating, I’d tried yelling. I thought about trying out dejected and discouraged as a new strategy. In the end I went back to the old standby of nice. But I did one more thing. I got to my appointment early and asked to speak to a manager and they sent my new little friend Dante to talk to me. Dante was wonderful. He listened to my story of woe, he played with my iPad a bit, trying to see if he could coax it into doing anything interesting, but it remained unresponsive to touch. I told him my idea that maybe we should start talking about a new replacement instead of a remanufactured device. I was very careful to word it that way. At that point Dante took me over to the Genius Bar and brought in my new little friend Chris. Dante explained that he and Chris were going to try to figure out a way inside their systems to get me a new device. I realize that this is often the hardest part. At that point I suggested to Chris that it wouldn’t break my heart if they gave me one of the NEW new models Apple announced just 2 weeks ago. We both had a good laugh about that. Hey, it was worth a try, right? Dante and Chris explained that they would let me return my iPad Pro and they’d give me an Apple Store gift card for the full price I’d paid, including AppleCare, and then I could turn around and buy the new one. Getting the AppleCare value back ($99) would be great because that meant that I got 19 of the 24 month for free, and clearly the great treatment I’ve been getting (3 iPad Pros) was because I had AppleCare. To give me my money back, they needed to find my original order. For some reason they had trouble finding it. Luckily I’d brought my Mac with me, so I was able to pull up my original receipt. As I was pulling it up, Chris reached out and started dragging his finger down my Mac’s screen. I told him to get his greasy little fingers off of my screen. We both had a laugh about his accidentally thinking it was an iPad. This will come up later in the story. At this point, Chris realized that they didn’t have any of the old iPad Pro models in stock, so they would have no choice but to give me a brand new, just released iPad Pro! But then they realized that Apple doesn’t have a 128GB model any longer, they only sell the 256. They told me it would cost me $150 extra to get a new one. With a twinkle in my eye, I said, “so you want me to meet you half way?” Chris didn’t get the joke of course, but I agreed that it was a very good deal for me. For some reason Chris’s system was unable to find my original order. He and I read the serial number from my order, the web order number, and some number printed at the bottom of my receipt. I’m not sure how he cracked the code in the end but he finally got it done. He refunded me the $950 for the iPad and $99 for AppleCare plus all the tax, and put it on an Apple Store gift card. They didn’t have the space grey 256GB iPad Pro in stock. No big deal, I could order on line when I got home. But there’s one more crazy bit to this story. When I got home and started the process to buy a new 12.9″ 256GB iPad Pro, I discovered that it’s not $150 more than the 128GB one from two years ago. It’s $50 LESS. Seriously. 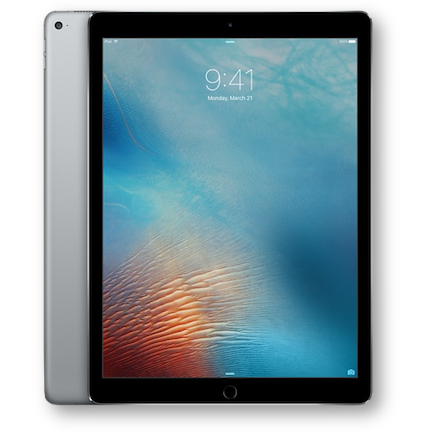 Turns out back in September, Apple dropped the price of the iPad Pro by $100. I’m going to get the newest model, twice as much storage, 2 more years of AppleCare, AND save $50. Oddly this model isn’t shipping until the end of June but I can wait a little bit for the new hotness. Now, ask me if I’m a fan of AppleCare. You have both the best and worst luck with Apple Care. I have only had one device without it. My Air 2 and all has been well to date. did you get a pencil? I’ve flip-flopped on getting AppleCare for my purchases over the years. Part of my ambivalence is because the only opportunity I have to deal directly with Apple is remotely – over the phone or in chat. Resellers just aren’t the same, although twice I’ve had major laptop parts replaced under warranty/AppleCare and it has been fine, just slow. Allister – I thought about that – would I even have called them on the very first time, if it meant being away from my device? Probably not. Probably would have just kept hitting ignore, and then bought a new keyboard when it fully failed. Barry – I do have a Pencil and I love it. PSA: don’t let your cat chew on it, they can dig holes in it. Sandy – The way I convince people to get AppleCare is to explain that I don’t buy ANY other kind of extended warranty, only AppleCare. I know it’s more useful for portable devices, but my $1000 monitor was replaced at 34 months into my AppleCare. Steve also had a major repair done on an iMac where they had to disassemble the entire thing. #justsayin. AppleCare is a necessity because hight tech products fail at the worst time possible. With AppleCare, no questions are asked, without AppleCare, It will cost lots of time, aggravation, and money to get back to where you were. And Apple high tech devices push the tech envelope.